Late in 1996, I began a photographic aerial survey of mixed grass prairie, covering the area of its ecological boundaries from Canada to Texas. At that time I began reading about the nineteenth-century botanical expeditions to the Great Plains, and felt an immediate affinity and admiration for these naturalists. Probably the main reason I photograph at all is because I fancy myself to be an explorer. Lately, instead of exploring outdoors, I’ve been exploring the vast collections in the storage areas of Chicago’s Field Museum, one of the world’s largest natural history museums. I am equally moved by the beauty of both the virgin prairie and the carefully collected and preserved specimens. Years ago, when my children were little, I began picking up dead birds and an occasional mouse I’d see when I was out for a walk. I’d zip these creatures into plastic bags and put them in the freezer in order to take them out later to photograph them. My daughter would be aghast when, after school, she would bring a friend home, open up the freezer for a Popsicle, and find it populated with dead birds. So, when I started working in the birds collection at The Field and discovered that they have a freezer, I felt I’d come home. As I worked in the various collections, starting in the herbarium, I began to question my own process. Wasn’t photographing these mounted plant specimens the same thing as photographing someone else’s painting and calling it mine? Wasn’t I simply appropriating someone else’s work? I justified my work by telling myself that I’d made the selections from thousands of choices and I’d figured out how I wanted to present them, and isn’t art, after all, about organization and selection? Isn’t that how I also photograph in landscape? That thought reminded me of why I take pictures at all. It’s because I see something that I want to share, that I want to hold up and say, ‘Look at this! Isn’t it amazing?’ So, the answer to my question is, yes; I am taking a picture of someone else’s work, as ever, to show you how amazing it is. My pictures are an homage to these plants and creatures and to their collectors. Another question, harder to answer, was, why kill all these beautiful creatures? They are lost to the world often in the prime of their lives. And why kill so many? Is it that important to gain the information we get from killing so many? Look at the coyote, glossy, gorgeous and dead. It was hard to photograph this coyote. I visited it four or five times before I was able to bring myself to set up the camera. I was in the process of losing my parents during this time, and the sad beauty of the coyote deepened my mourning. But this, the dispassionate act of collecting, of cataloging, is how we come to understand the world, isn’t it, we of Linnean descent? Karl Linnaeus gave us his taxonomic system in 1735, and he considered it to be inclusive of all of life, though we know, of course that the things he names are infinitely more complicated and interesting to observe than any taxonomy allows. Nevertheless, as playwright Mary Zimmerman has written, ‘Scientific inquiry into the ways of the world is an act of sustained, intense attention, which is another way of saying an act of love. When I look again at the coyote, and look at the jackrabbit I remember Albrecht Durer. 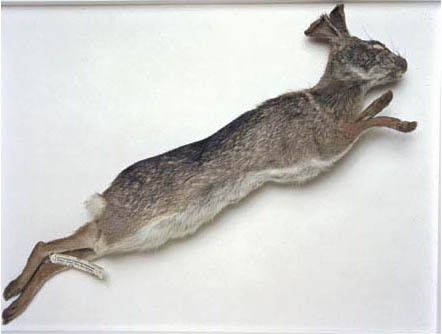 Are you familiar with Durer’s painting of Large Tuft of Grass (1603) and his Hare (1602)? Northern German painters such as Durer, Hans Hoffman, and others had a keen sense of observation, almost scientific in its intensity. Or is it artistic in its intensity? Is there a difference? 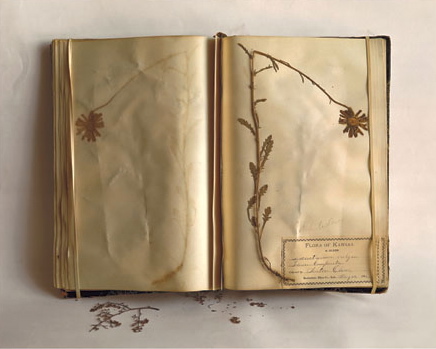 The plants held just as much a sense of presence as the animals, and in some ways were even more evocative, in the yellowing of the paper on which the specimens were mounted, in the flourish of handwriting on the labels, in the romance of time and place suggested by these labels. I had just been reading about the great western explorer, John Wesley Powell, when I came across a specimen of Big Bluestem grass collected by George Vasey, a great nineteenth century botanist, on Powell’s first expedition toward the Grand Canyon in 1868. Powell didn’t make it to the Grand Canyon that year and George Vasey dropped out of the expedition early, but this is one of the specimens he brought back home. As I held this specimen, my skin tingled and I felt as if I were touching the hand of the collector himself.In the exhibition, we tried to heighten this sense of involvement by including field journals and other written material produced by the scientist/collectors, including an 1868 letter we found in the Field archives from Vasey, in which he reports receiving a promise of assistance for his Colorado collecting expedition from General Ulysses S. Grant. Another theme of the exhibition is the paradox between the unique individual and the generic type. 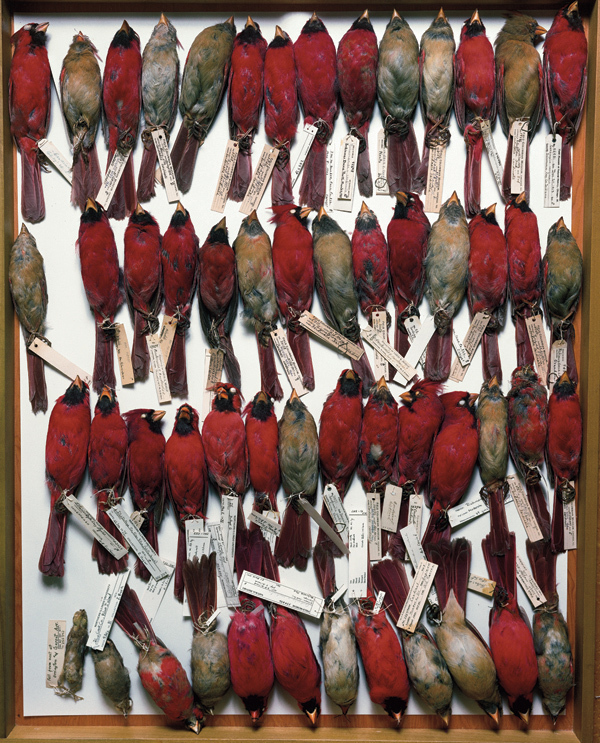 For every species that is collected, there is a type specimen: the one specimen that represents all the other specimens and by which the others of its kind are measured, sort of the Miss America of that species. But just as important as the unique, individual type specimens are the large populations that accompany it. 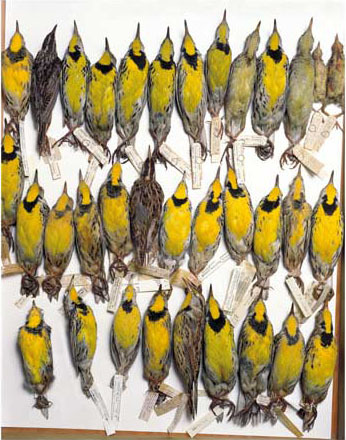 Look at the drawer of meadowlarks. Each black bib is slightly different, one from the other. Matt Matcuk has written that as the world rages on, scientists must still collect. 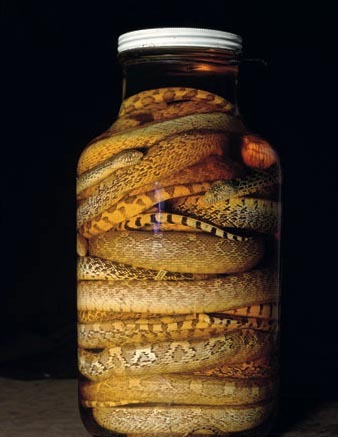 For example, the bullsnakes were caught during the Great Depression, the Texas spiny softshell turtle during World War Two. Matt said he found this somehow comforting. So did I. One of my first meetings about this exhibition with my Field Museum project team was the week after September 11. As we sat in the museum cafe, the museum staff members were very focused on discussing the development of this exhibition. I was not focused. I was distracted and wondered how an exhibition of this work could possibly matter in light of the tragedy a few days earlier at the World Trade Center, the Pentagon, and a field in rural Pennsylvania. How could my work, or the work of scientific collecting, matter in the shadow of those events? But I got through that time of doubt because I eventually was able to remember that sustained, intense seeing of the world does matter. It always matters. How else can we know where we fit in relationship to everything else in the world, but by seeing it with attention, concentrated sustained attention. And that is where my work and the collectors’ work comes together.